Locals only: I'm hiring some helping hands! I am looking to hire some students to help with the assembling, making, collating, stuffing and other handiwork required for various UPPERCASE projects. Projects include preparing envelopes of goodies, assembling handmade books, button-making and other hands-on tasks as required throughout the year. Work will begin immediately and be concentrated in August and once the school year begins, it would be on a per project or as-needed basis. Please email me if you are interested. janine at uppercasemagazine dot com. Please note this is for local Calgarians, with preference given to students. Most work will happen in the UPPERCASE studio downtown. View more images at JeremyriadI recently came across the pencil sculptures of artist Bob Ban Breda. Alas, I missed his most recent exhibition that was in San Francisco, but more googling resulted in closer views of Bob's work and his inspiring collections. Visit SF Electric Works for more great images. I'm definitely a collector at heart, which is why Lisa Congdon's A Collection a Day blog in which she posted a special arrangement of one of her many collections throughout 2010 was such an inspiration. It was so inspiring that I asked Lisa if we could collaborate and turn the web project into a book! What you might not know is that I procrastinated in contacting Lisa for quite a while. I was expecting a baby and just figured Lisa's idea was so good that surely a big-name publisher would just scoop it up! My entrepreneurial and design drive weren't yet dampened by late-night feedings, so I emailed Lisa with my book proposal. I was honoured that she preferred to work with me rather than any other publisher and that we shared a similar vision of what the book could be. Since Lisa would be busy completing her online project until December 31, 2010, I figured that when the time came for me to design the book, I'd be accustomed to motherhood and it wouldn't be too difficult to get it all done. I'd design it late that year and just add the final pages in January and off it would go to the printer! Sounded simple enough. What I didn't anticipate is that after the initial getting-to-know-you months of having a new baby, and the few months of exquisite babyness in which they lay happily on the ground and stay in one place, is that the growth and development rate is incredible! I would just get used to one stage, and Finley would quickly be on to the next one... rolling over, crawling, standing... walking! Designing the quarterly magazine plus committing to publish four books (The Elegant Cockroach in October 2010, Work/Life 2 and A Collection a Day in Spring 2011, and The Suitcase Series Volume 2: dottie angel for later this summer) and being a new mom has been a challenge and then some. I'm still in awe that I'm getting the job done—and proud that everything that I've released is very high quality, unique to UPPERCASE and most definitely a labour of love. There have been some late nights (and some crying), but the first 16 months of managing a business and mothering a baby have gone pretty well. I think a lot of newcomers to UPPERCASE don't know that it is still essentially a one-woman operation. (But believe me, I'm exhausted.) Over the next months, I hope to get more help in managing the logistics side of publishing—distribution, circulation, subscriptions—since there really is way too much work for one person to handle, especially since I don't have as much time as I used to. UPPERCASE is my baby, but it's getting too heavy to hold on my own. Anyway—back to A Collection a Day! We're having a summer blog tour! What better season to start a collection or two? With flea markets and garage sales (and more time for eBay?) now's the time to add to your collections or start a new one. A Collection a Day can be purchased right here. thanks! "Rare Device was renowned early on for its carefully edited collection of design objects, books and fashion, and for supporting small and innovative designers and artists whose work was not easily found in stores. I sold Rare Device in February 2011 but the entrepreneurial bug has not left me. I have met so many wonderful designers, crafters, artists, retailers, buyers and bloggers and have learned a great deal from every one of them." Rena has since harnessed her experience as an artisan, designer and shop owner and is passing on her knowledge on through retail consulting. She can help you start a new business, open a store, evaluate your product and help you get noticed by the right people. After reading Rena's guest post "Too Much Success" on Poppytalk, I immediately emailed to thank her for a post that hit really close to home and invited her to extend her experience to UPPERCASE readers. For her first column (appearing in the fall isssue #11), we are accepting questions. What would you like to know about starting or maintaining your creative business? In what areas do you need most encouragement or advice? Please leave your questions in the comment section. It has been nearly six years since I first moved my design business into Art Central in downtown Calgary. At the time, my plan was to have a nice design studio and, as a side business, I would also have a small shop selling design-related books and stationery. Thus UPPERCASE was born. I mused that someday I'd like to publish books under the same name, so I designed a logo that would look good on a book spine. I didn't think I'd delve into publishing so quickly nor so thoroughly, but I love it. Alas, I had to close the physical retail aspect of UPPERCASE one year ago. Expecting a baby was a big factor in the decision, but also the cost of maintaining store inventory plus paying magazine print bills was just too much to take on. Customers through the building had begun to dwindle and Art Central didn't have the buzz of activity and energy that it once had. I had far more web traffic and online orders than actual people coming through the door and the need to focus my business to an online model was very clear. I still love my studio space in Art Central and plan on revamping it to meet my current needs (baby-proofing?) I hope to be able to work downtown on a more regular basis now that Finley is approaching his first birthday. I have lots of ideas for events, workshops and the like to best make use of the space... it is just a matter of finding time! I am dedicated to staying in Art Central; I think the place still has loads of potential as a focal point for creativity and community in Calgary. However, over the past two years, tenants have come and gone and it has definitely been seeing some tough times. We could blame this on the economy but that's an easy excuse. I would like to hear your opinion on Art Central. What can we do to make it better? What would you like to see happening in the building? What sort of tenants would be a good fit? What would you like to see and do in UPPERCASE? Please leave your comments below or if you have something lengthy to say, please email me. I'm happy to be part of the Creative Inc. blog tour organized by Chronicle Books. 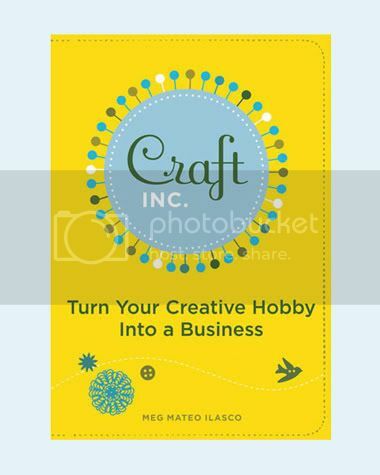 Co-written by Meg Mateo Ilasco and Joy Cho, Creative Inc. is a guidebook for setting up your own creative enterprise. With a friendly and encouraging voice, the book is a great resource for those just starting out as a freelancer (designer, illustrator, stylist, photographer and other creative fields). Even if you've been around for a while (like me) you'll find inspiration and motivation to keep forging your own path. One of the toughest things as a freelancer and entrepreneur is to keep positive, keep working, keep striving. It is nice to have mentors such as Meg and Joy in whom you can find such encouragement. I follow Joy's blog daily and so it is nice that we get to include her in the upcoming issue of UPPERCASE magazine. In the inaugural article for a new column entitled "Beginnings", Joy graciously found time in her busy schedule to speak with Erin Loechner (Design for Mankind) about how she got her start. It is an informative and entertaining read with even more great tips for creative business. I've just sent out a second renewal notice to our inaugural subscribers. If you started with the very first issue, then issue 4, with the bird on the cover, was the last issue included in the initial subscription. Part of the unique quality of UPPERCASE magazine is the open dialogue I have as editor/publisher/designer with our readers. Through this blog and your emails, I'm in direct contact with many subscribers and have gotten to know you through your blogs, flickr and messages of support. You offer so much inspiration, thank you! I hope you are all equally inspired by our quarterly publishing efforts. The glamourous world of publishing! (boxes, boxes and more boxes) That's Jenny in the top photo, if you can find her. Another magazine favourite has seen its last days. F+W (they also publish How and Print) are ending the 55-year run of I.D. magazine. "Certainly the downturn in print advertising has contributed to this decision," says the company's president here, "but other factors include the fragmentaton and specialized information needs of I.D. 's core readers (product designers) and the plethora of information resources available to them—some for free (online and B2B) and others that are highly specialized and targeted to specific industries served." I'm really saddened by this news; that yet another magazine with really great content and a long history has been shuttered. Even though I publish a magazine, I NEED other magazines in my life! They offer other perspectives, other ideas, other worlds of inspiration. But UPPERCASE carries on with its small, streamlined staff (hey, that's me! ), talented and enthusiastic Editor-at-Large Deidre Martin, the ever-helpful Jenny Tzanakos and the generous family of UPPERCASE writers, illustrators, photographers and collaborators. Thank you to our amazing subscribers (954!) who believe in our content and vision. Although we offer a few pages of ads in each issue, our model for sustainability is based on subscribers, not advertising. Please keep your subscriptions and renewals coming in! As the magazine approaches its first anniversary, it has surpassed all of my expectations—and hopefully yours as well. This past week I have been immersed in the design of Issue 4 and I am very happy with how it is shaping up. (The cover is almost ready to be revealed!) I will post some teaser images soon. Artist Camilla Engman may live in Gothenburg, Sweden, but her appeal is international. A professional illustrator and exhibiting artist, her images are whimsical, poignant, humourous and insightful. With her keen eye for finding the extraordinary in the everyday, Camilla documents her inspirations and artwork on her popular blog. Nearly 2000 fans visit her site on a daily basis (with three quarters being from North America) to get a glimpse into Camilla’s creative life. UPPERCASE is proud to have been the first gallery outside of Sweden to feature her work, in our 2005 exhibition “Best in Show”. We are excited to be collaborating on a book of Camilla’s art and life, the first volume in our “Suitcase Series”, to be released in the fall of 2009. I am looking forward to travelling to Sweden next month and meeting Camilla (and her cute dog, Morran) at long last. The Suitcase Series presents in glorious detail the lives of select artists and designers. The books are image-based, full of artwork, sketchbook pages, beautiful photographs and artifacts from where the artists live and work. Interviews with the artist are included in both their native language and English. The books’ size will be small and intimate, like a diary/sketchbook and each book in the series would have a special treasure added: perhaps a small limited-edition art print, a vellum envelope filled with foreign paper scraps for collage, fabric swatches, etc. The book becomes a precious souvenir of a creative journey shared between the reader and the artist. For our book and magazine subscribers, you will be receiving the Jen11 and Camilla books as part of your subscription. If you'd like to preorder Camilla's book by itself, click here. All pre-orders will include a unique keepsake of the project. Magma is a trio of design bookshops on London's Clerkenwell Road, Covent Garden and an outlet in Manchester. They have an extensive library of books in their online shop; their selection is top notch. Four years ago, when I was conceptualizing UPPERCASE, I would look at pictures of Magma as inspiration for my own bookstore and design space. They are inspiring not only in shop design, but their philosophy of bookselling is also admirable. The Magma approach to shopkeeping is to create and nurture an interactive community: "We think that there is something extremely rich and dynamic in the notion that people, all kinds of people, from all kinds of backgrounds, are walking through our doors on a daily basis, looking for something, not always sure as to what they are looking for. More often than not, these people are more knowledgeable with regards to their areas of interest than we are, or could ever hope to be. And this keeps us going. A shop feeds on feedback. It thrives on people's responses, on their enthusiasm and their frustration, on their ideas of what is good or bad, on what they buy and what they don't buy. A shop is unthinkable without that highly stimulating flow, individuals walking in with their ideas, with their more or less intense curiosity, their various personal concerns, their quirks, their calm or manic energy, their unique point of view." Deidre and I are thrilled that Magma will be carrying UPPERCASE's publishing efforts. Old School, Work/Life, The Shatner Show as well as a selection of Eclectonotes have crossed the pond, arriving just in time for the final days of Christmas-shopping frenzy. 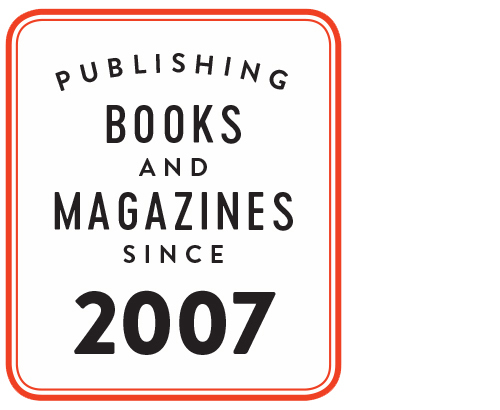 To have our books recognized by Magma is the best Christmas gift we could receive as an independent publisher. Thank you, Magma. There's a good interview with Jannick of Neawear over on The Storque. I've been following her posts on Flickr and recently purchased some earrings (below) that are simple, beautiful and very affordable. I always find it inspirational to read about other creative people "taking the plunge" into creating full time. There is such a big leap of faith when you put your creativity out there for all to see. My Eclecto notebooks and pouches are featured in the latest issue of How magazine. It's fun to see that they shot original photos! Alas, the problem with making things by hand is that it is time-consuming and I am currently out of stock of the notebooks. We do have pouches and notepads and Eclecto Type Treasures available in the shop. And I am working on making the Eclecto notebooks so that they are consistently available in UPPERCASE as well as wholesale, with redesigned covers, binding method and other features — giving the entire line a makeover! If you are interested in carrying the Eclecto notebooks in your shop, please send me an email and I will keep you up to date of the launch of the new items. Other How magazine content of note: Joy Cho's Nantaka Joy products, an article on Old School artist Linzie Hunter's illustration and a commissioned illustration by Work/Life contributor Darcy Muenchrath. "Idea generation is an addiction...an engaging, brain-spinning indulgence that must be practiced in moderation." This statement is from the Behance's article which cautions on the intoxicating side-effect of idea generation. "New ideas have the potential to transform your life in wonderful ways, but they are also the most notorious source of distraction. Frustrated entrepreneurs and struggling creatives often trace back their problems to a moment when they decided to pursue too many things at once." This certainly rings true for me! Over the past three years, I have opened UPPERCASE, curated a few dozen gallery exhibitions, designed a line of wholesale greeting cards, made hundreds of handmade papergoods, launched an online store and published a book. All the while, I have continued to maintain my graphic design business. I admit that this is quite a lot to manage and though it has been exhilarating, it is also exhausting. The arrival of a new year always brings about contemplation and resolutions. Leading up to 2008, I had been looking forward to putting more focus on my creative and business endeavours. UPPERCASE gallery, books & papergoods has developed into a bigger project than I could have possibly imagined when it first began. It its infancy, I thought it would be a small bookstore — a companion to complement my graphic design studio. It quickly became an outlet for my creativity. If I had an idea for a product, I could simply create it and see an immediate response from my customers. UPPERCASE allows me to conceptualize all aspects of a project — from concept to production to marketing to distribution. It truly uses all aspects of my creative thinking and I find this very fulfilling and enjoyable. Although working for clients has its rewards, it is so much more satisfying to have full ownership of an idea and its design. Over the past year, the balance of my business shifted from Vangool Design to UPPERCASE as I began to devote increasing amounts of my time to the store. The success of The Shatner Show in terms of the quality of participants, press and other attention, was phenomenal and was a definite turning point. It put my small enterprise (pun intended) on the map. Although the show and book have just broken even at this point, with proper distribution now in place I hope to make enough to eventually fund another book. My current self-directed publication project is Work/Life: the UPPERCASE Directory of Canadian Illustration & Photography. The intention of this publication is to promote Canadian talent to the best clients across North America. Participants pay a reasonable fee to be in the book and this, along with some sponsors, will cover the production and distribution costs. Some incredibly talented people have signed up! Necessarily, I have had to decline a lot of client work in order to have time to dedicate to Work/Life. After a decade of freelancing, it is against my nature to turn down a job — but now it has become a necessity to do so. I regret the inconvenience this will cause to some of my clients, but I know they will wish me well. I won't be turning absolutely everything down: I will focus on my love of publication design and special arts/culture projects, plus I remain open to any amazing unforeseen opportunities might come my way. This book covers absolutely everything you need to know if you've ever toyed with the idea of turning a profit with your creative pursuits. Craft Inc. guides you step-by-step through the very basics of tapping into your creative interests, coming up with a name for yourself, pricing your wares, sourcing the materials you'll need, eventually leading you to the point where you could be booming with business and getting up for work every day to do something you genuinely enjoy. Also, interviews with artists-made-business owners like Lotta Jansdotter, Jill Bliss and Jonathan Adler provide practical insight and inspiration. I couldn't put this book down because like most creative individuals, the idea of making money from what I do for fun seems like a total dream, and after reading Craft Inc. I have a pretty good idea of how to get started. Written by designer/illustrator/business owner Meg Mateo Ilasco. Announcing our next book project! Work/Life is a book project celebrating Canadian illustration and photography. Unlike magazine awards annuals or traditional illustration directories that are little more than picture books, our publication delves into what fuels a creative life. As a participant, you will be interviewed for specifics about your creative focus and artistic technique as well as your inspirations and aspirations. Additional imagery (sketchbook pages, studio shots, inspirational objects or personally illustrated anecdotes) will be integral to each participant’s spread, allowing the reader to take a peek into your work/life. In addition to the artist pages, Work/Life will have more editorial content such as insights from industry mentors, interviews with reknowned art directors, and the documentation of a real illustration job from start to completion from two perspectives: from the art director who hires and the commissioned artist who gets the job. This editorial content further elevates Work/Life from the average directory: our goal is to produce an informative, entertaining, beautiful and long-lasting book that will be a valued reference for art buyers. Each participant will have a double-page spread: one full page dedicated to a single illustration and the companion page including a editorial text and images specific to the artist, a brief bio and contact information. The book will be sent to a targeted list of 400 of the most desirable clients in publishing, advertising and design in North America. Participants will receive one complimentary copy. The book will be launched at an opening reception of an exhibition featuring work from the book. Complimentary copies will be given to invited guests that evening. Following the launch, Work/Life will be sold in UPPERCASE’s bookstore and online to the general public at a modest cover price. The online store presents a selection of my favourite stationery items, interesting objects, recommended books and works for sale in the gallery. Please have a look around. More items and inventory will be added on a weekly basis. Calgary customers have the option of having their purchases couriered city-wide; Canadian and US customers can select from Canada Post and FedEx shipping. If you run into any glitches with the site, please let me know: it's brand new to the world, so there's bound to be some growing pains. Thank you! The shot above is my initial rough of the site design. The product shots (below) are original photographs taken specifically for shop.uppercasegallery.ca with my newly indispensable Nikon D40. They were shot in the store and throughout the Art Central building. You're welcome to use images from the webstore as long as you credit UPPERCASE and link back to us, thanks. The concept of UPPERCASE gallery, books & papergoods is to present the world of graphic design and illustration through products and exhibitions. Visitors can peruse a curated selection of high-quality books on visual and pop culture, purchase paper products unique within the city, and view artworks by internationally reknowned artists alongside emerging and local talent. As the saying goes, time flies when you’re having fun! It has been very satisfying to develop UPPERCASE, both as a destination as well as a brand. It has become a fantastic outlet for all my creative enterprises, many of which extend past the gallery walls. UPPERCASE greeting cards are now being distributed across North America by Paper E. Clips (look for our typographic greetings at the Boston Museum of Fine Arts). Our Eclecto line of buttons, journals and pouches made from reclaimed and vintage papers continue to be popular. Look for them featured in an upcoming issue of Lou Lou magazine dedicated to eco-chic > living. Folks in Edmonton can also find the Eclecto products at Collectiv (#102, 6421 - 112 Avenue 491-0002. www.collectiv.ca). The biggest project to date is also a dream come true: to publish UPPERCASE books. Our first publication is entitled “The Shatner Show” and will be released to coincide with an exhibition this summer. The Shatner Show presents over 70 artworks inspired by William Shatner. The outstanding roster of participating artists includes Douglas Fraser, Calef Brown, Mark Todd, Martha Rich, Christian Northeast and so many more. Mr. Shatner has approved the project and a portion of all art and book sales will be donated to his charity. Over the next months, we will be developing the exhibition’s website, www.theshatnershow.com. Please visit now to see the full list of artists and links to their portfolios. To help with the initial production costs of the hardcover, full-colour book, we are looking for “send me the Bill” patrons. For $250, you will be placed, in the order received, on a VIP list. These patrons will be able to put their investment toward the purchase of the artwork of their choice. (Please note that Mr. Shatner will receive first dibs!) Patrons will also receive a free book and some other special opportunities. Please contact me for more details. It is definitely an exciting and very busy time at UPPERCASE. I hope that you share my excitement for these many projects. As always, your patronage, suggestions (and help) is greatly appreciated. Thank you to all my loyal customers, enthusiastic friends and supportive family. A special thanks to my husband, Glen Dresser, for not tiring of all these crazy ideas and projects. I usually shy away from referring to myself personally when posting on this site – I tend to refer to "we" or "UPPERCASE" when announcing new shows and products or recommending links. This habit began in 1996 when I was first starting my design business, Vangool Design & Typography. Working from home and growing a design business when I was 23 and fresh out of college, it made me seem a little more confident and capable. Since I opened UPPERCASE in March 2005 (and moved my design business out of the small room off the kitchen), I've slowly grown accustomed to being in a more public spot. My old situation allowed the occasional sleep-in and pajama workday. Sometimes days – or even weeks – would pass before I'd need to interact with a client or service provider in person. But after nearly ten years of working from home, I was really itching to get out into "the real world". When Art Central opened in November 2004, I was immediately enamored with its potential of creating a community in Calgary dedicated to art and design. This was really what I was craving after all those years of working alone. I could imagine my long-term dream of having a studio/design bookstore happening in this space. I had previously set aside the bookstore idea as impractical since so many lovely independent bookstores had come and gone in Calgary. But with Art Central as a larger entity helping to pull in like-minded customers, my hopes for a design bookshop in Calgary were re-ignited. I reasoned that my design business would support the rent and operating costs of running a store. My expectations for the store were minimal. Within about two weeks of seeing an empty available space (and falling in love with its gorgeous brick wall and view of the York Hotel's art deco details), I had presented a business description to my landlord and signed the lease. To fit with the mandate of Art Central, I couldn't just have a design studio: it would also have to be open to the public. So the concept of the store was to present the world of design and illustration, and of a working graphic designer, in a public way. Estimating costs, listing pros and cons, and following my intuition: that was the extent of my business plan. Here a photo of me taken last week. I'm surrounded by boxes of holiday items being prepared for wholesale and online customers. I'd like to thank my husband, Glen, for helping me when things get overwhelming. Here he is – coincidentally dressed to match my Christmas cards. I'd also like to thank Katie, who works in the store on Saturdays and Sundays, giving me much-needed weekends!